When the inaugural issue of Popular Demand was released in late 2012, it left readers wanting more of this mysterious compilation of creative works. Luckily, just this past week, the magazine released a second edition, Issue Too, to a bevy of excitement. The mag, which boasts contributors such as Claire O’Neill of fellow D.C. 'zine The Runcible Spoon, Morgan Hungerford West of Panda Head, and writer/model Kate Greene, has already tapped some of the city's finest and most well-known creatives to participate before reaching its first birthday. The founder and editor-in-chief, local illustrator Bryan Minnich, combines the photography, artwork, and writing of friends and peers from D.C. and elsewhere to create a visually and mentally stimulating publication unlike anything we've seen so far. Popular Demand is available at Treasury, 1843 14th Street NW, 202-332-9499; Joint Custody, 2337 18th Street NW, 301-221-2225; and Redeem, 1734 14th Street NW, 202-332-7447. Jamie Hurst of the blog High Heeled Traveler is taking her online success into the print world with her newly launched mag. 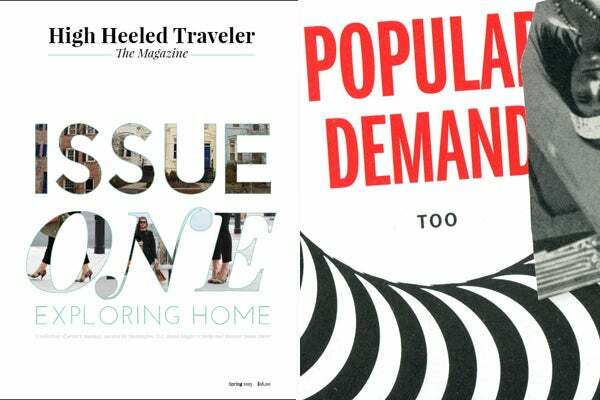 The inaugural spring 2013 issue, entitled Exploring Home, quickly sold out online, proving that this writer and travel guru is a force to be reckoned with. It will be released quarterly (waiting for summer 2013 any day now), and focuses on one specific concept per issue through creative writing, photography, and even recipes. The first issue concentrates on the meaning and resonance of “home," while the soon-to-come summer 2013 issue, The Road Not Taken, will focus on the illustrious Robert Frost poem of the same name. Fortunately, Hurst’s blog is alive and well in the meantime, sating our appetite as we anxiously await the next issue. When released, the next issue can be purchased online for $18. You can purchase a subscription to the magazine for $65. Writer Kate Jenkins was working as a waitress when she decided she couldn't bear the lack of understanding of 20-somethings of America. That mixture of disenchantment, zeal, and determination led Jenkins to launch The Intentional in April. The publication highlights artwork, journalism, and non-fiction essays by young people with voices to be heard — and aims to not just illustrate Generation-Y struggles, but also help resolve them. To enhance the authentic, homegrown feel of the publication, Jenkins accepts submissions from writers and artists.